Cathy Rowson/Mad Cat Marketing values your privacy and cares about the way in which your personal information is treated. 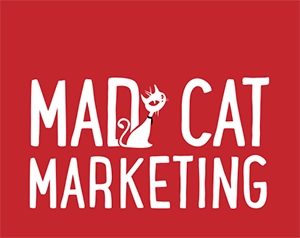 Cathy Rowson trades under the name Mad Cat Marketing. See ‘Data controllers’ below for more information on the entities that control and process personal data in Mad Cat Marketing. Information will, of course be gathered during verbal or email contact. But it will not be used for marketing purposes by Mad Cat Marketing or be sold or shared with third parties for financial gain. We collect information from you as part of our business acceptance processes and about you and others as necessary in the course of providing website and branding design services. We collect your personal information while monitoring our technology tools and services, including our websites and email communications sent to and from Mad Cat Marketing. Your personal information will be retained in accordance with our global data retention policy which categorises all of the information held by Mad Cat Marketing and specifies the appropriate retention period for each category of data. Those periods are based on the requirements of applicable data protection laws and the purpose for which the information is collected and used, taking into account legal and regulatory requirements to retain the information for a minimum period, limitation periods for taking legal action, good practice and Mad Cat Marketing business purposes. We are a UK Based website, graphic design, consultancy and branding company and we operate within the UK as well as the EU and Globally and any information that you provide to us may be shared with and processed by any entity in the UK that is associated with Mad Cat Marketing and our associated firms. If in the future we re-organise or transfer all or part of our business, we may need to transfer your information to new Cathy Rowson entities or to third parties through which the business of Mad Cat Marketing will be carried out. The level of information protection in countries outside the EEA may be less than that offered within the EEA. Where this is the case, we will implement appropriate measures to ensure that your personal information remains protected and secure in accordance with applicable data protection laws. EU standard contractual clauses are in place between all Cathy Rowson entities that share and process personal data. Where our third party service providers process personal data outside the EEA in the course of providing services to us, our written agreement with them will include appropriate measures, usually standard contractual clauses. Cathy Rowson is the Data Controller.